[BB-Blog]: Little Red Riding Hook. Little Red + the Big Bad Wolf. 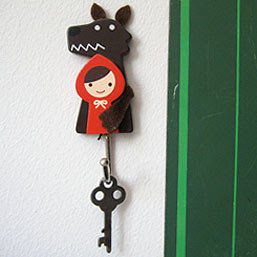 A wonderful fable illustrated on a sweet key holder. Just the thing to place your keys or even to hang jewelry. Measures 3.5" inches by 1.25" inches. I can dig it. Super cute! That is one item I need to purchase ASAP. So adorable. It reminds me of something that you would find at Fred Flare.